(03-03-2016, 02:21 PM)crazyidiots Wrote: Does the full limit break mission increment on units that have already been previously limit broken? Yes. In fact, if you get say... 9 of the same units, you can use 4 to limit break one unit, and then use the fully limit broken one + 3 others to limit break a new one, netting you two units fully limit broken. You could really rake in points this way, if you actually have space to keep all the C and UC units for limit breaking purposes. But since garage space is soooo precious, I usually sell the one with no duplicates or already at full limit break. I've been just selling everything the entire time for the sake of saving space and getting pocket change. I guess I'll only sell the R units I get now because those chips are precious. Did you get a new account Mai? I've literally been sitting here wondering how you were still posting current stuff when the Dynames account hasn't been used in like 3 months. So the Kshatriya event is actually a Formidable Foe Event. Gah, I hate this kind of events. We need to constantly play. Oh well. Time to slave away. ... great. I ran out of garage space again. its one of those weird R support units that are very good, please don't equip this on shooters, its a waste on my opinion. all the supports above are rewards from the story,you clear it and get them all. It begins with Marida receiving orders to attack the colony to steal unicorn or whatever, latter Banagher its on the colony like on the beginning of the first movie, he is wondering about Audrey and about what he should do, when the colony is attacked, he runs to the mansion and meet a character from what i believe its from a show that i don't watched, giving him free pass to unicorn. on the space Athrun is with some characters from Goshogun and they are here for unicorn as well, a battle breaks inside the colony, Banagher gets out, Creuset and Frontal are friends, and its decided that Creuset will be the one that will see Unicorn strength, he attacks, Banagher can't really keep up, Lacus arrives on Eternal with Mwu,Dearka and Kira, they save everyone and Marida is recruited on Eternal, the Goshogun characters as well. them we follow with Creuset and SEED villains following the Eternal and a lot of battles till the last one where Banagher finally uses the NTD and Creuset retreats, the story didn't ended, after the event there will be more probably. 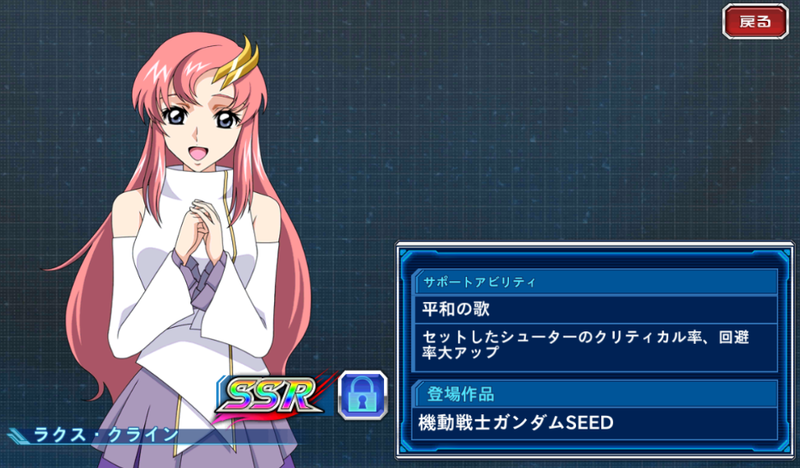 Decided to have another go up to step 3 in rage of having reset the other day and I got Haman. All is good in the world again. but Haman its unique on that, even if you can't get another Haman, she will still be relevant as a leader for the team. Ok that does it. I have to draw Haman somehow. Now, should I stick to the first three step-up gacha, or go all the way and broke myself for not getting her? Lady Luck be with you then. 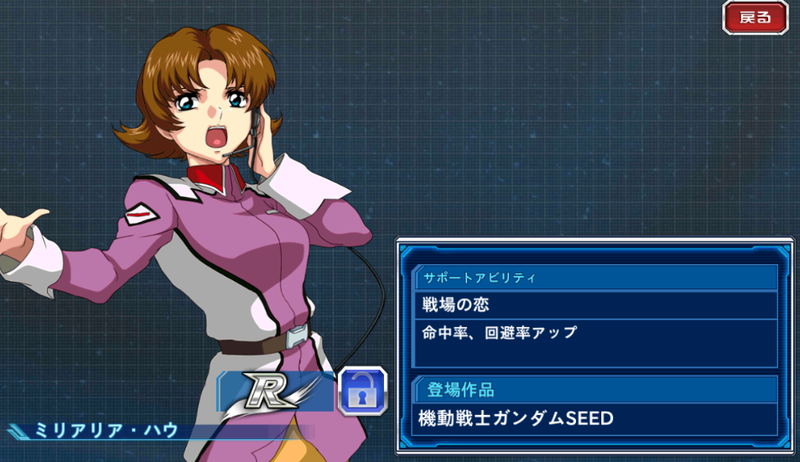 Anyway, I've killed Puru-35 now. Still no problem so far. Edit: Single pull everyday doesn't seems to be that bad. 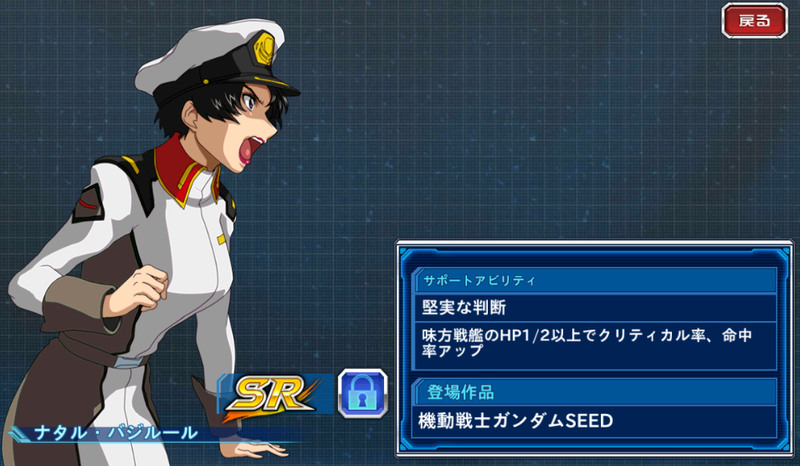 I got SR Riddhe. It's pretty effective considering that you get a crystal for doing all the daily missions and you also get a SR EXP upgrade for shooters just from doing step 1. The value is too good to the point I feel like I'm robbing the game.